But, let’s park all that. No, the mortification is related to the portrayal of the Irish as a nation of Guinness swilling drunkards. This may have been true in the past but we are a far more advanced than that nowadays. While some of us work to maintain the reputation of the loveable, porter soaked tosspot, others of us enjoy a glass of wine or even a whiskey or two without shouting at passing cars or doing less than appropriate things in doorways. Our gastronomic endeavours also have moved on from boiling potatoes and eating raw onions. To prove it, I am going to show you Irish Seafood Chowder served with Wholemeal Brown Bread Scones. Seeing as it’s nearly St. Patrick’s Day, I might even relent from my puritanical stance and swill a bottle or two of stout. Sure, it’s St. Patrick’s Day! The first of two ingredients shots. That’s two pint bags of frozen prawn stock at the back. *Don’t use fish that has been painted with ‘smoke flavour’. It is not the same as smoked fish. Trust me, I know. 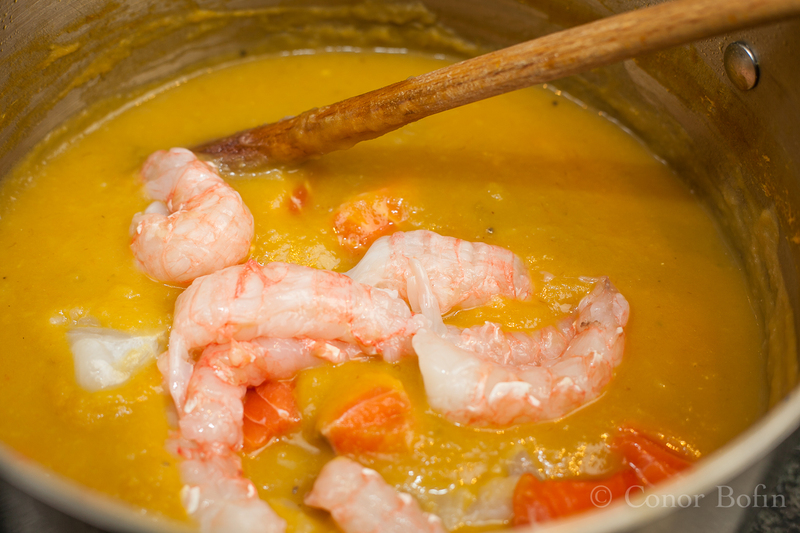 Put the vegetable stock and prawn stock in a big pot. 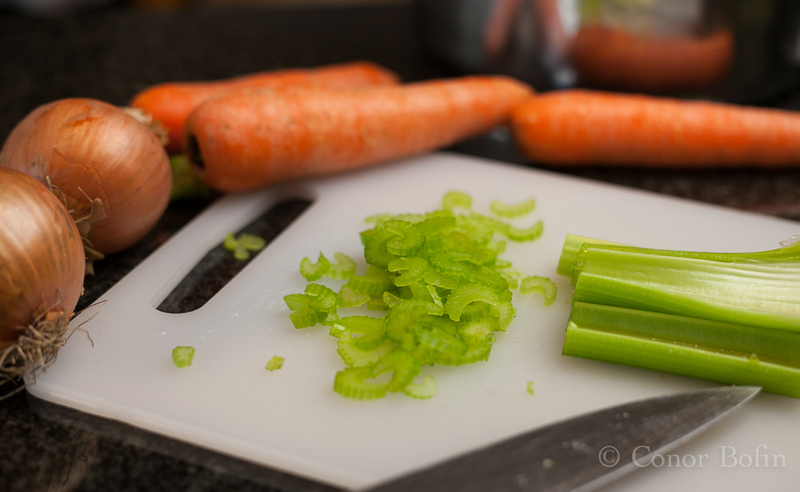 Chop the vegetables up nice and small. Add them to the pot holding back the onions, two carrots, one celery stalk and two potatoes. Heat it up and reduce it by about a third. This will intensify the flavours and cook the vegetables. Taste it and season as appropriate. There is a good deal of chopping required. 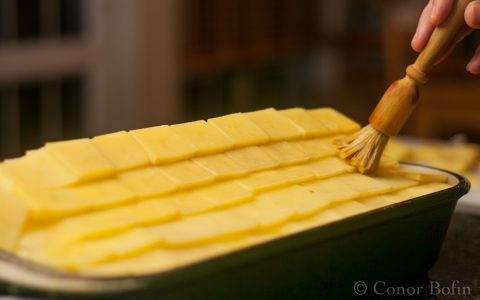 If you are doing this for St. Patrick’s Day, get the chopping done before you start drinking. Next, sweat the onions. Resist the temptation to wear a green t-shirt with “Kiss me, I’m Oirish” on the front. Concentrate on the cooking. Plenty of time for frivolity later. My onions, sweating like a drunkard waiting for the bar to open. While the onions are sweating, skin the fish. 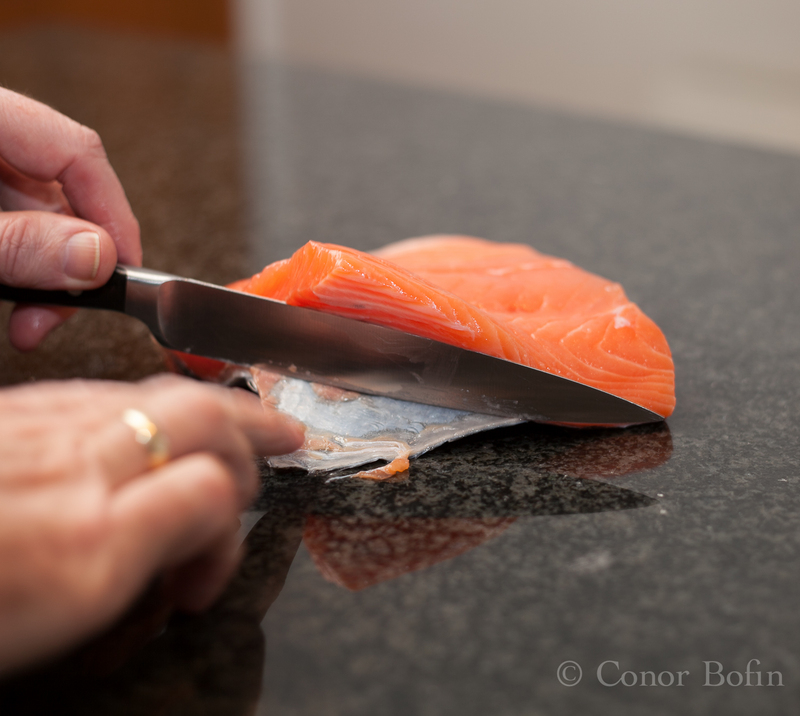 Another sharp and bendy knife in use here. No drinking just yet. Chop the fish and celebrate with the first drink of day. Perhaps a nice can of Guinness to kick off St. Patrick’s Day? Sure one can can’t hurt, can it? Three kinds of fish chopped and ready. As is traditional, celebrate with a can. 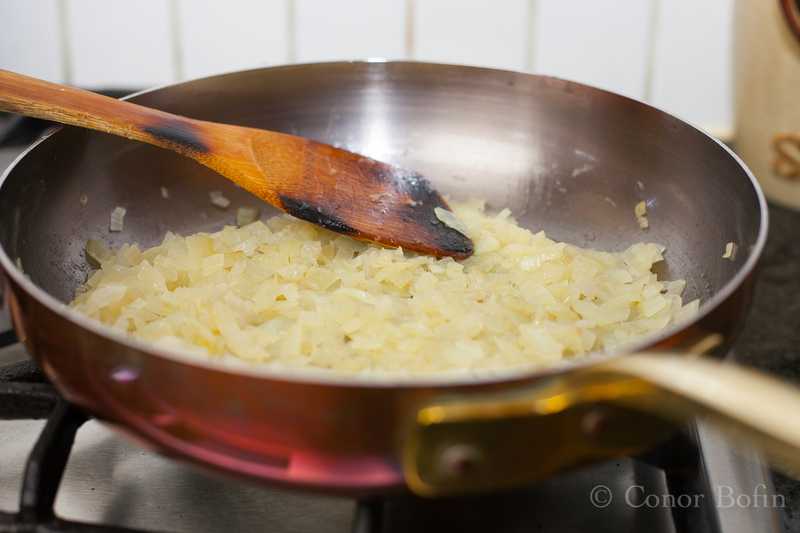 Add the onions to the other vegetables in the stock. Take the vegetables off the cooker and add them to your blender. In this case, they get put into the smoothie maker. It must be the drink getting to me! A nice bottle of O’Hara’s will steady the nerves at this stage. Sure, a bird never flew on one wing. 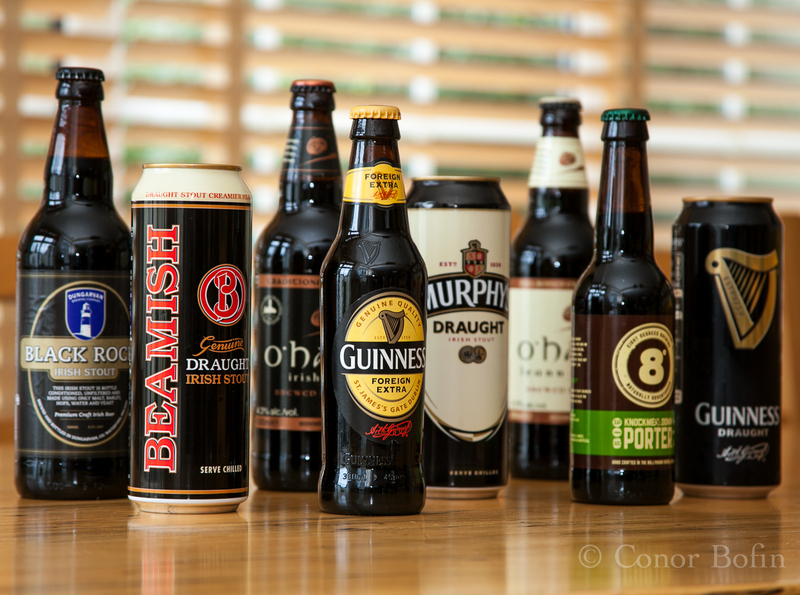 O’Hara’s do a couple of different stouts. We might have the other one later. Now, where was I? Oh yes, the chowder. Blend it until smooth and put it back in the saucepan. The chowder starting to come together. Nice and smooth. Just like the O’ Hara’s. We might have a drink to celebrate that but we have the prawns to shell. We’ll have a quick can of Murphy’s Draught Stout, a sly one as they say. No need to say anything about it. No harm in having a swiftie. Sure, a stool never stood on two legs. Let’s celebrate that we have shelled the prawns. lt’s St. Patrick’s week for goodness sake. Celebrate our heritage! Break out the Beamish, another fine Irish stout. Nothing like a little celebration to keep everything on track. A table never stood on three legs. Now what were we doing? Oh yes. Hold on there for a few minutes. Comfort break. You can look at my scone ingredients shot while I am gone. Back to the cooking. 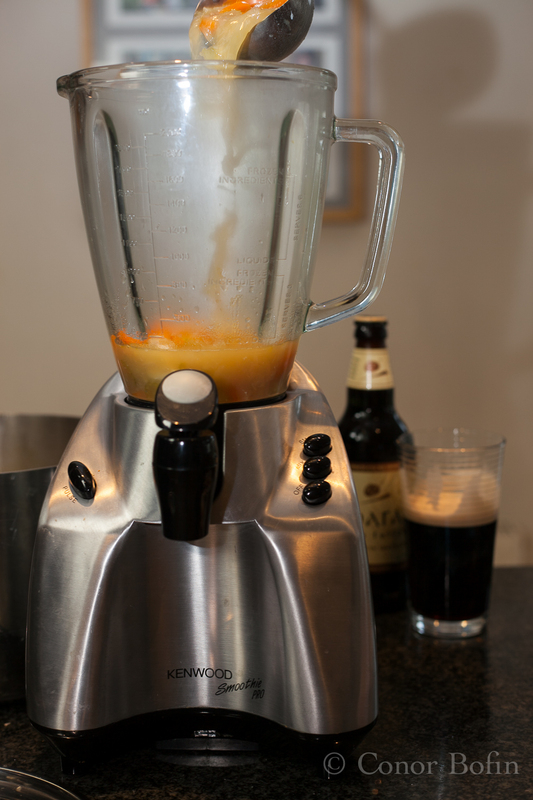 Add the uncooked vegetables into the saucepan and heat gently for about as long as it takes to have another couple of bottles of stout. Half an hour should do it. St. Patrick’s Day is great, don’t ya think? Sieve the flours and dry stuff into a big bowl. 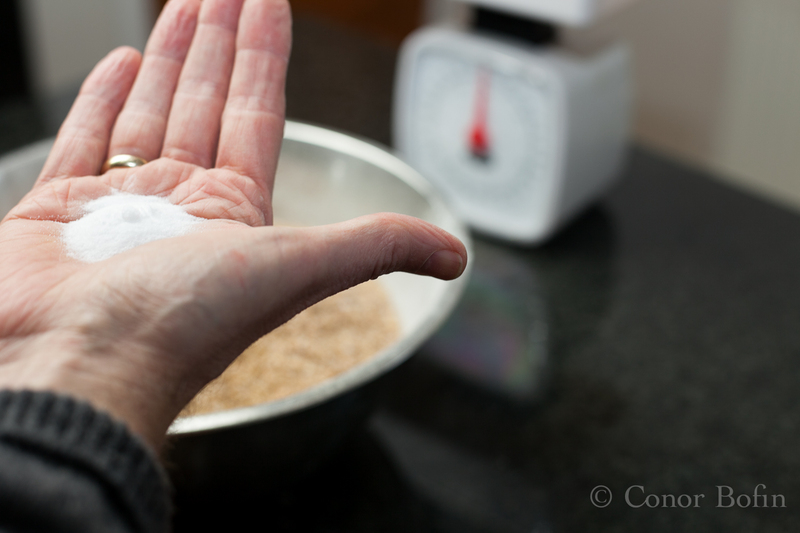 An artistic enough shot of the flour. The drink is bringing out my creative side. The couple of scoops made me forget the salt. Don’t bother measuring it. About a small handful is a teaspoon I think. Go on, chuck it in. It won’t kill ya. Too much might give you a thirst. No harm in that. Pour in the buttermilk. Add the honey and butter. 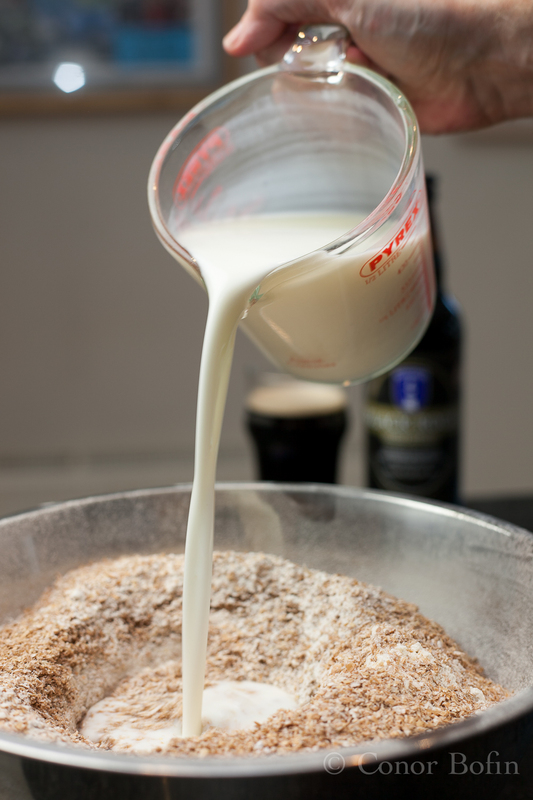 Given that your are probably feeling a bit lugubrious from the stout, transfer it all to the food mixer and let that do the work. Imagine, all that stout and not one pouring shot. The buttermilk will have to suffice. That was a bottle of Dungarvan Black Rock stout in the background. A bit more mellow than the Guinness. 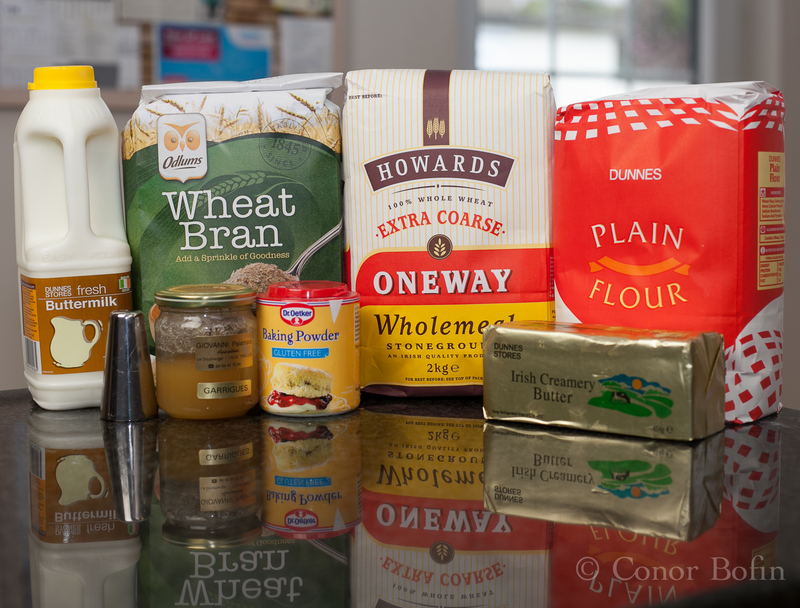 If you don’t use the food mixer, you will need fortification before combining this lot. If you do, you will have time to sit on the kitchen floor and enjoy the Dungarvan’s dark mystery. 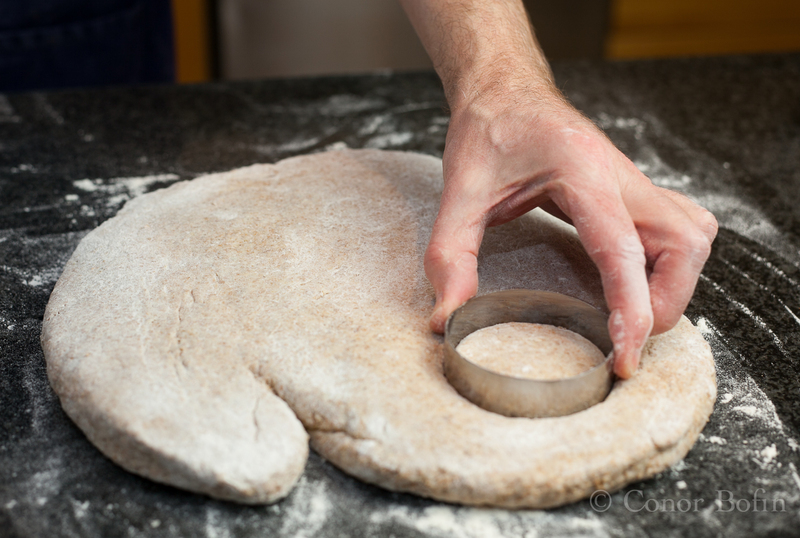 Get up and roll out the scone mixture and cut out the scone shapes like what I am doing in the next picture. Thankfully, no requirement for a steady hand. Cut out the scones. I’m half cut myself. Scones ready to go in the oven. Time for a quick bottle of Knockmealdown porter. This was my favourite of all the stouts, from what I can remember. God bless St. Patrick! 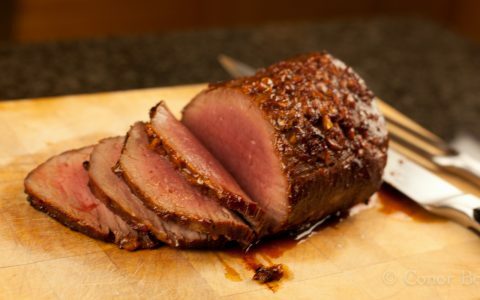 Half an hour to 40 minutes in a 200º C oven. Time for a quick nap to steady the nerves. 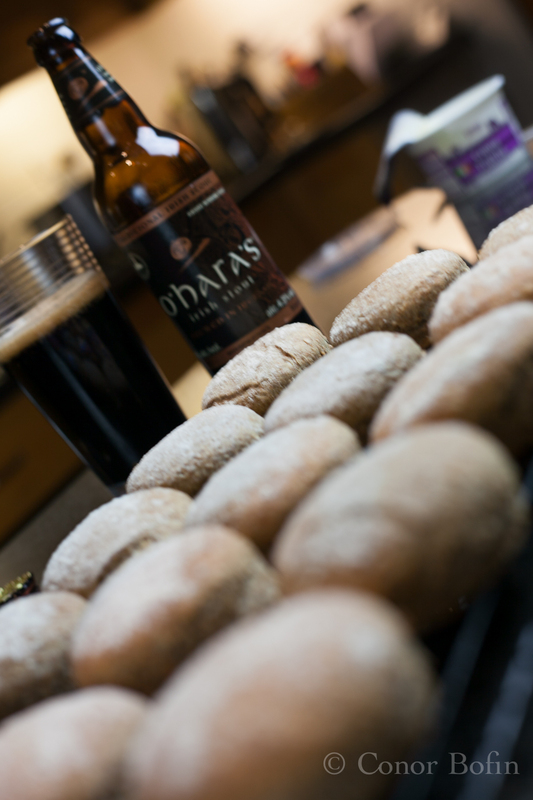 While the scones are cooling down, perhaps the other bottle of O’Hara’s? At this stage of proceedings, one is probably feeling a little ‘tired and emotional’ as the excellent euphemism might have it. Time for some soakage (food). 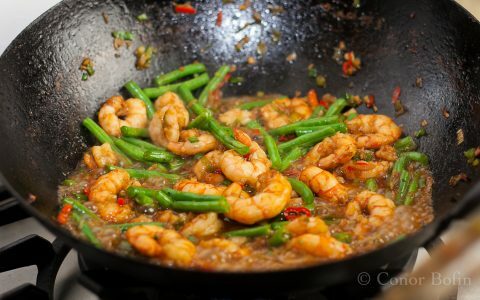 Toss the fish and prawns into the saucepan and heat through for about five minutes. Thankfully not long enough to consume too much more drink. Lovely prawns and fish pieces added. Nearly time to eat. That’s about it. 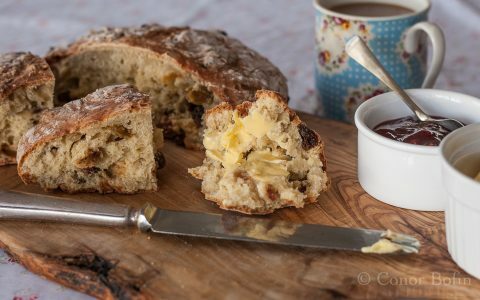 Only time to butter your scones, serve the soup and perhaps have a quick bottle of Guinness Export. Sure, you’d have to, what with St. Patrick’s Day and all…. My least favourite of the stouts. A real heavyweight coming in at 7% alcohol. Not for the faint of heart. I wish they had exported this bottle too. Publisher’s note: The author fully intends spending St. Patrick’s Day quietly at home with his family. None of the implied excessive alcohol consumption is recommended as a sensible life choice for anybody over the age of 12. Enjoy St. Patrick’s Day responsibly. May you be half an hour in heaven before the devil knows you’re dead. Hopefully, that death will not be from drinking all these fine Irish stouts at one sitting. That looks delicious! Can’t beat a good chowder and a nice brown scone! Too true. Sadly, it’s the weather for it. Your chowder looks delicious and that salmon looks so fresh! HI Rosemary, Yes, I am lucky with the fishmonger just down the road. 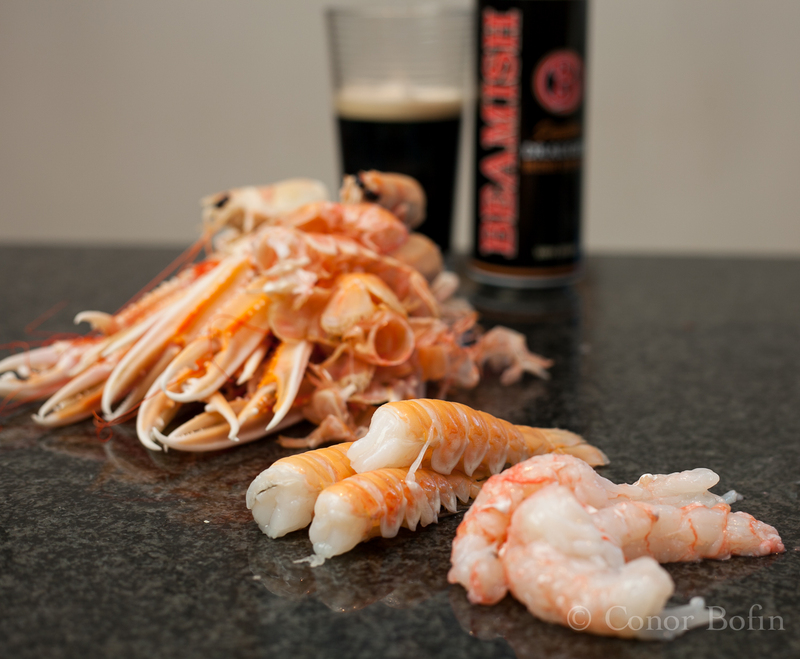 I never realized — until now — that Irish people eat (or cook) prawns. Also, I always believed that you wrote and photographed these contents whilst under the influence. Thank you for breaking that stereotype. I must have been making a pretty good impression Adam. Occasionally, the camera lies. A nice looking chowder…especially enjoyed the last photo. I was pretty happy with that too. Though, I did not have long as by that stage, I was pretty hungry. He is welcome, as long as he leaves the snakes outside. You mean you are not a bunch of drunkards over there???? Crap, and I was going to come visit!! 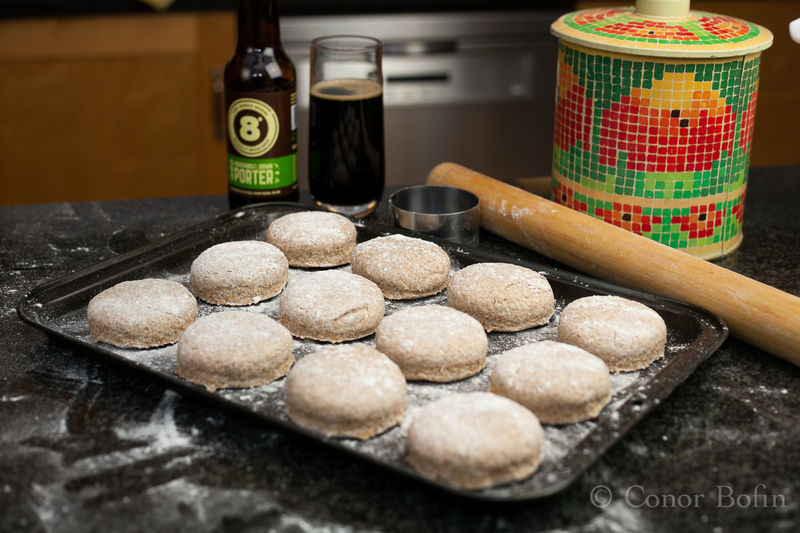 That is a beautiful chowder and those scones….sigh…..
Connie, come on over and we will open a few in your honor. Excellent as always. No saffron, or turmeric or something, to get that rich yellow? Looks fab. I shall be raising a glass of the black stuff on Sunday to my favourite blog/ger. Happy St Patrick’s Day to you Conor. You’ll be ready for another pint or two yourself by then. Hi Adam, no, that colour is from the vegetables. I picked Irish flag colours too. Happy St. Patrick’s Day. You must have been tired after that lot! And emotional MD, and emotional. Hello, I’ve stumbled 😉 over from Karen’s Back Road Journal blog to your delicious beef and Guinness pie; we’ve already had beef this week, so that unfortunately cancels out that lovely recipe for at least one week, but I’m really loving this chowder and who doesn’t love scones? Your prawns look completely different to the prawns we have in North America, ours don’t have tails and claws! Is the taste more like a lobster or a shrimp? 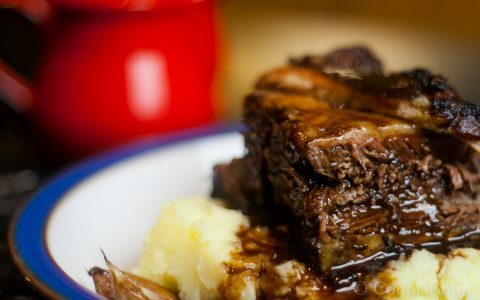 This recipe will definitely go on my Sunday menu; it will be perfect after some copious celebrations at my friend’s Irish Pub, The Roy Public House in Leslieville in Toronto Canada http://theroy.ca/. If it all works out, would you mind if I blogged about it at a later date? Hi Eva, I would be delighted fo you did. The difference in the prawns is more of a name thing. You call them Norwegian Lobster or Langoustine or (sometimes) shrimp. Enjoy The Roy and let me know when you post. oh Connor you have me in stitches – how on earth did you manage to cook all this fantastic looking fare? With some help……??? Enjoy St. Patricks Day with your family – we missed you here on screen. Slainte!!!! Happy St. Patrick’s Day to you too Carina. Yes, moderation. I’ve heard of that. Fantastic post. The chowder looks divine and I love the first photo. I would like to taste each one, though not in the same day. I am one American that does not drink in excess on St Patty’s Day. On another note, what has been the general response in your area to the new Pope? Happy St. Patrick’s Day. Thanks for the kind words. The news reports a very positive reaction to the new boss of the catholic church. For myself, I parted company a few abuse scandals ago. Though, I do wish him well in his endeavour. I am not Catholic but I pay a lot attention to news about the church because my best friend is in seminary to become a priest. He is one of those Catholics with “new ideas”. I think the new pope has a lot of work/improvements to direct but I wonder if he will be able to overcome the infighting, etc. But if he makes the church a safer place and it’s members nicer people, the world will be a better place. 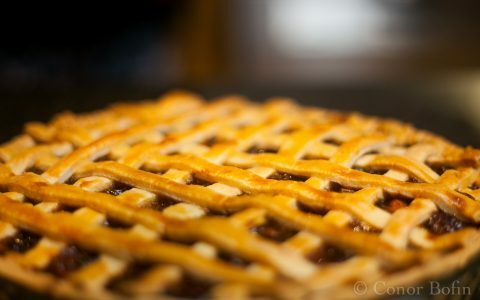 This looks amazing, so delicious! Thanks indeed for the kind words. Have a great St. Patrick’s Day. YUM! as you may have heard, St. Patrick’s day is a pretty big holiday in Chicago. We send some environmentally friendly green dye on its way to Ireland (someone did study the water flow and concluded some of the Chicago river water should make it to the shores of Ireland!) followed by drinking copious amounts of green beer (I do not recommend it!). I personally prefer a more food focused celebration with Irish beef stew and Guinness chocolate cake 🙂 I have to admit, I will probably miss the taste of Guinness from an Irish tap (I am not crazy, it is better!!!) after my visit this past summer. You are right. Everything tastes better here in Ireland. I will head over to the west coast and look out for the green river of friendship from you guys. Happy St. Patrick’s Day. I do have a chuckle on how Irish everyone becomes though to be fair, with the potato famines and such the Irish did go forth and populate the world. I’m half Irish due to those events. A few even survived the coffin ships in the 1800’s. Strong stock! But at the end of the day I think most are looking for an excuse to drink. 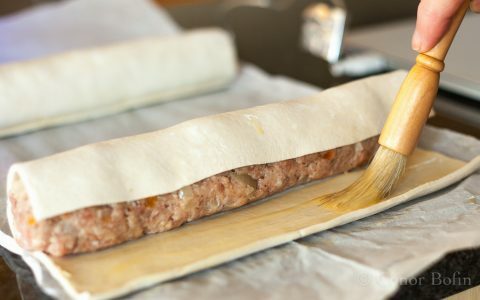 This recipe looks wonderful and would be perfect for the cold raw day we’re having right now. :). Though as we don’t actually have the kids I may venture out. I’ve never gone out on St. Patrick’s day. Probably should try it just once. Looks wonderful – great pics! You knocked this one out of the park, Conor. (Yes, a baseball metaphor.) You certainly used enough fish to ensure everyone will have a hearty bowl of a very flavorful chowder. This is a dish you reserve for holidays. Thanks for sharing recipes for both, the chowder and your scones. If I’d had more Créme Fraîche and less stout, I might have been up to spelling it. Thanks Meggie. I really appreciate that. I am not too optimistic about our chances. At least we have an Italian to blame! Must have ended up like a Floyd cooking show in the end (I nearly ruined Christmas dinner having been left in the kitchen unaccompanied with a decent bottle of red a couple of years back). 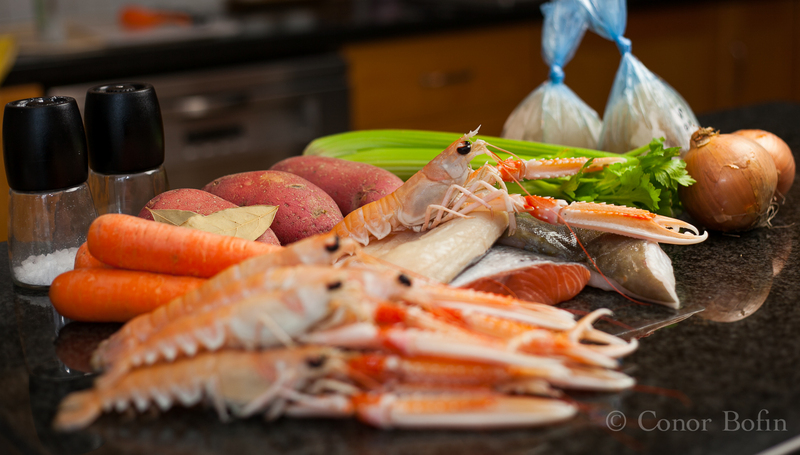 For me, chowder is the ultimate vehicle for good seafood (other than ‘as it comes’) – looks great! Thanks Phil. It was a bit of fun and the chowder turned out pretty well all things considered. Brilliant post. It’s nothing short of a St Geor…sorry I mean St Patrick’s Day miracle that anything resembling food made it to the table looking at the variety of stout consumed. And congratulations for finding an actual function for a smoothie maker. Well spotted. The bread maher will be next on the list. Happy St. George’s Day! None went into the soup. But, yes. That is the difference. Happy St. Patrick’s Day to both of you. The Wife sends her best too. Happy St Patrick’s to both of you, too! Methinks you cheated there with those fancy Oirish stout bottles: how come everyone else loses the capacity to think and spell correctly and you are SO wordperfect with both in the end;) ? 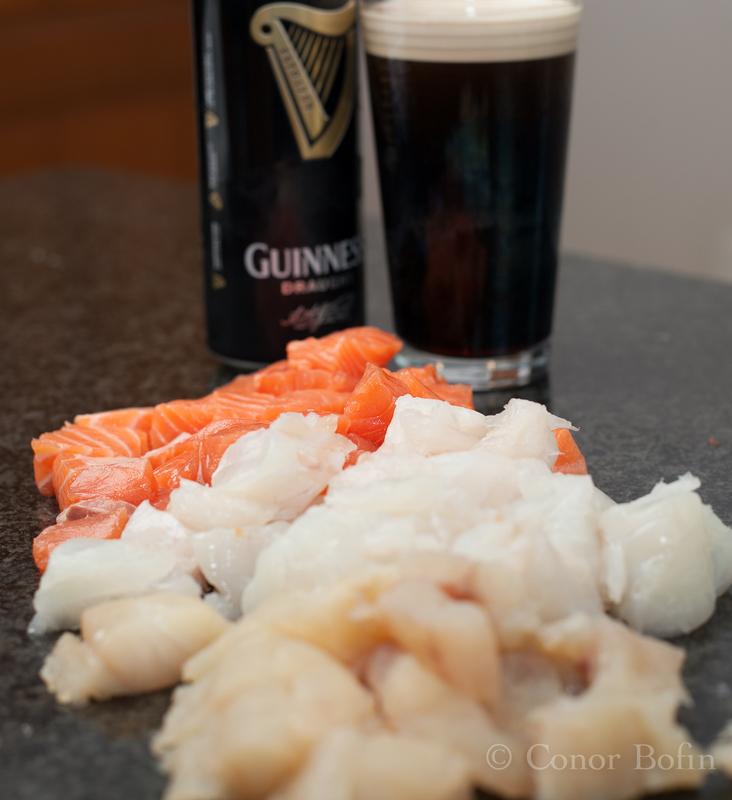 Super bowl of seafood goodness I’ll surely copy, but may I have a couple of glasses of dry white and not be considered a traitor to the St Pat’s Day traditions 🙂 ! Happy St Patrick’s Day Eha. Fantastic looking chowder, wow! So you Irish over there in Ireland aren’t drunkards? Why is it that all the Irish (and wanna-be Irish!) here in Montreal are most definitely drunkards on Saint Patrick’s Day? 🙂 They’re giving you a bad rap! We have a few here too, trust me on that. 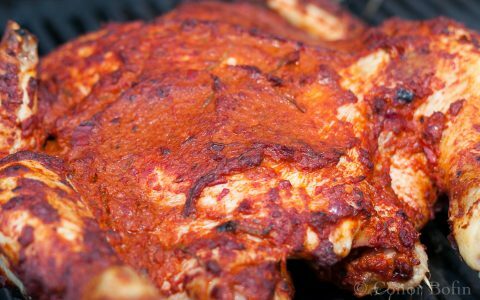 Love the post, the recipes and the photos, especially the last one. Beautifully done.I’d love to give this a try but I’m busy with an unexpected immigration issue that needs my attention. 😉 Thanks. How does one say bravo in Gaelic? Math an Fear (good man). Lovely post yet again Conor! I wish the prawns that we get here looked that good. In our little neck of the woods butcher is something that is one does with the deer they have bagged. Fishmonger is me at the local lake… The food looks amazing! I love the blending part of the chowder. 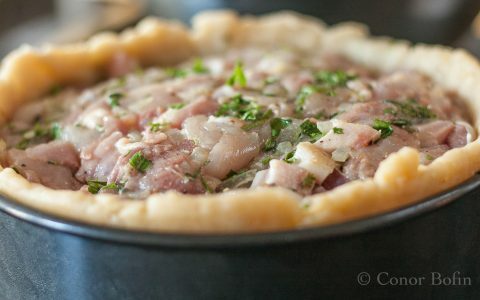 That works really well the thicken the texture and allows the many flavors to roll over the tongue! Thanks Barb. It does tend to be a crazy day of overindulgence. I will be taking it easy, I promise. Excellent. The smaller producers are wiping the Guinness eye. Whole family travelling? 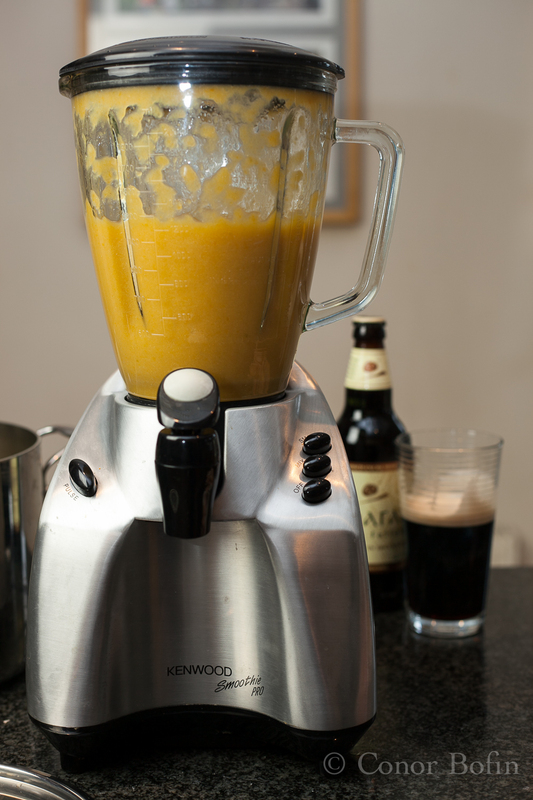 Two recipes in one plus some insight into the modern Irishman. I expect nothing less from you. And thanks for humoring us Yanks by “lowering” your stands and enjoying a Guinness. You’re a stereotype AND an individual. I love it. Great looking meal, too. Thanks Tommy, it was fun to do. Healthy too, with all that vitamin B in the stouts. Too funny!! I’m all for the stout, being part Irish! I did read in the paper this morning that food from Ireland is “up and coming” and there is a movement afoot to elevate their cuisine. You’ve done that right here.. they should be writing this one up in the paper next! Fun post, Conor! There was a story this morning on NPR about green matzah balls… Being a Sunday this year, I’m sure there were green cream cheese to go with the lox availalbe here in LA though that is singularly unappealing. Now it’s time to go home and stay away from bars (or restaurants with bars) or people with cars for that matter. That is a good plan Flori. I have to admit that we hid from it all today. Happy St Paddy’s Day Conor. Great recipe, I love your scones. 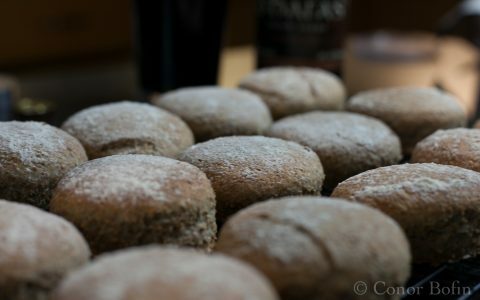 The Irish really are the best at yeast free breads. I wish my wife had brought some recipes over with her. Thanks for the kind comment. 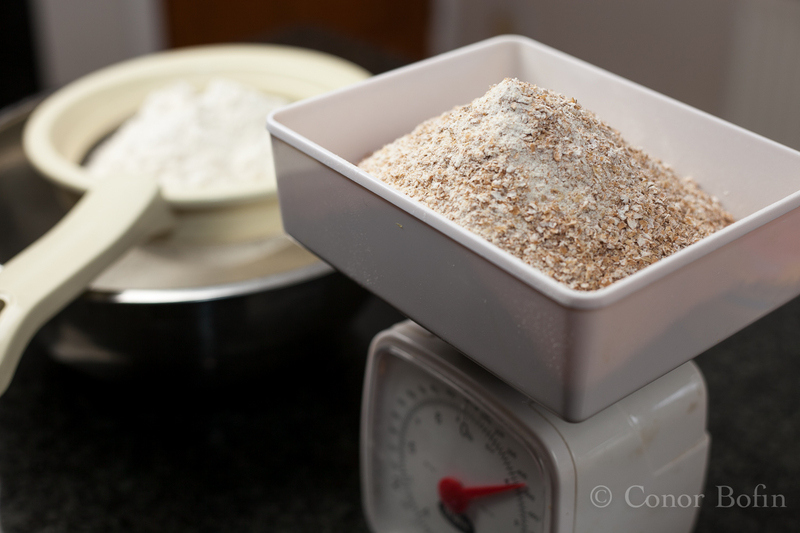 If I can recommend the Odlums Flour site Odlums.ie. they have plenty of authentic recipes. I love the look of your chowder! And the scones too! 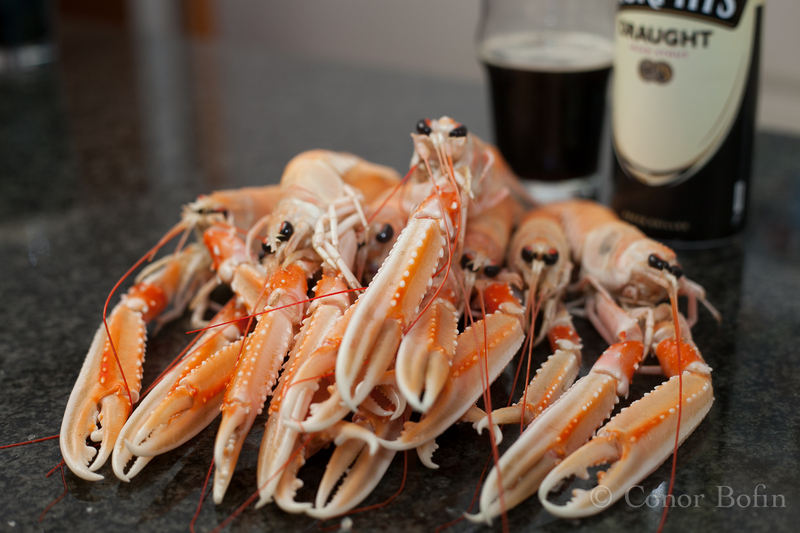 I must have a closer look at Irish foods, it looks delicious and love the langoustines! Thanks Petra for your comment and thanks for visiting my blog. You are welcome back any time. A very happy (and belated) St Paddy’s day! Blessed be the Irish, the leprechauns and the old folk at Guinness. Send some of that stout this way, I’d drink it! On a more serious note the chowder, scampi & brown bread scones are the perfect boozy accompaniment. 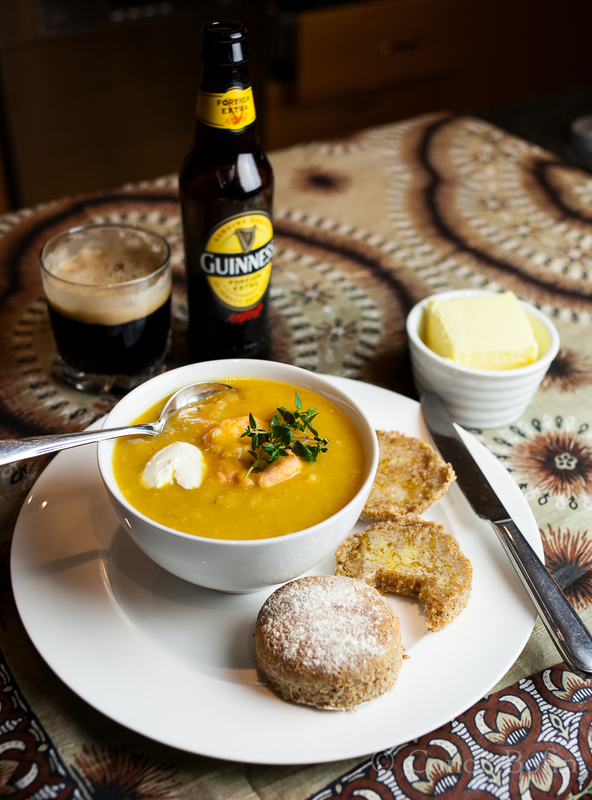 I could totally enjoy a night in with a stout, buttery scones and hearty soup, any day! Get over here for next St. Patrick’s Day. The welcome mat is out for you! Thanks Monika, you are too kind. Tuesday is my Monday; back at work, start of the week… I don’t want to be here, as everything is getting on my nerves. Then I read your post, laugh out loud in my empty shop and come to the conclusion that I should probably go back to do/ start a bit…. That or take my car and Feck off West to Ballyvaughan for a big bowl of Chowder over sunny Galway Bay. To be frank ( Haha… I know), it could go either way! Nice one!